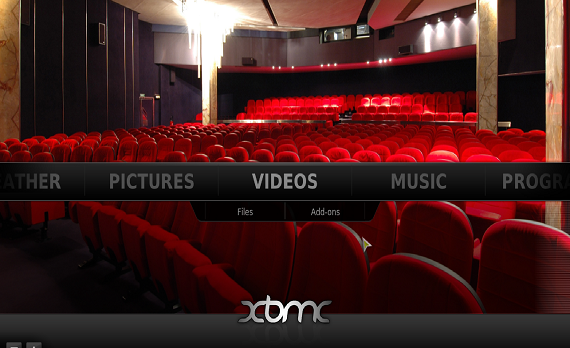 XBMC Media Center 11.0 Eden is a media player application which is open source as well as freeware. It is available for various operating systems like Windows, Mac, Linux etc. Current version of this program is quite stable as compared to earlier versions. It is quite easy to install and use. XBMC can play almost all audio and video formats and even files inside ZIP and RAR archives. Once installed, it can transform your computer into a multimedia jukebox. It is based on network playback where you can stream your multimedia from anywhere at your place or from the internet. XBMC can also play CDs and DVDs directly from the disk or image file. It will automatically create a personalized library complete with box covers, descriptions, and fanart while scanning your media. 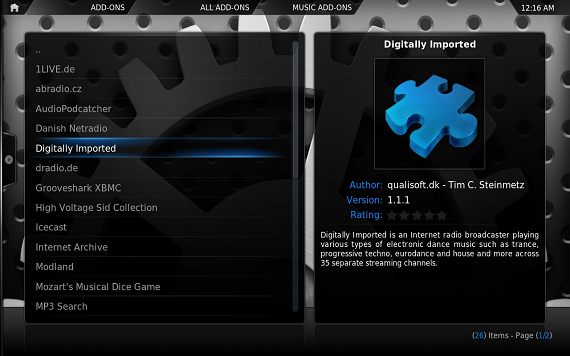 XBMC has playlist and slideshow functions, audio visualizations, a weather forecast feature and many more. XBMC is developed by volunteer software developers across the globe under a non-profit organization. Various fixes and improvements have been done. Improvement in GUI engine for making it more powerful and flexible. Dirty Region support is added to reduce CPU usage. Added ability for all addons to provide their own web interface. Addons can be searched in Addons-Manager now. Improvements in playback and library. Simplified the way FanArt works throughout the skin and the settings for it. Playing videos is the key feature of XBMC. You can make a list of videos in video library and it offers you the complete organization of this list. List can be organized on the basis of video content information like movies, albums, serials etc. This associated information is easy to obtain through many ways for example through scrapers. It can automatically download movie posters and fan art backdrops display them as background wallpapers. For video playback, XBMC uses two separate multimedia video player ‘cores’ which are DVD Player and DS Player. Audio playback is another important feature of XBMC which uses PA Player i.e Psycho-Acoustic Audio Player for playing audio. This audio player is XBMC’s own in-house built audio player which supports a large number of audio formats. It has a music library which is like a database of music collection. This feature allows you to create and search playlists associated with the information stored in music file title, genre, artist, album etc. It can also automatically download album covers and fan art backdrops display them as background wallpapers. This is one ultimate feature of XBMC with which anyone can add additional media content to this open source multimedia application and extend XBMC with addons. These addons can be audio or video addons, screensavers, weather forecasts, themes, web interfaces, web scrapers and much more. XBMC supports multiple digital picture or image formats like RAW image formats, BMP, JPEG, GIF, PNG, TIFF, MNG, ICO, PCX and Targa/TGA. You can easily view, browse and zoom pictures with this functionality. You can manage your picture files and even play them in a slide show option. 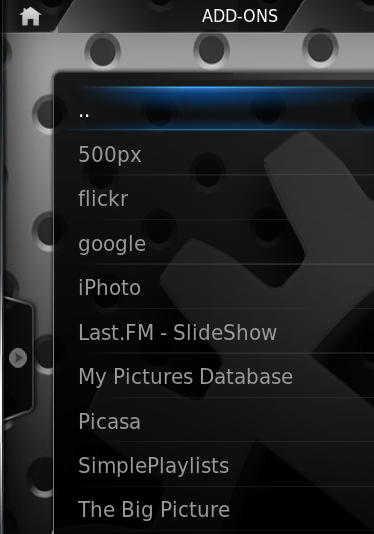 You also have options to view picture with Picasa, The big picture or create your own playlist. Video formats: MPEG-1, MPEG-2, H.263, MPEG-4(both SP, ASP), MPEG-4 AVC (H.264), HuffYUV, Indeo, MJPEG, RealVideo, RMVB, Sorenson, WMV, inepak. Audio formats: MIDI, AIFF, WAV/WAVE, AIFF, MP2, MP3, AAC, (AAC+), Vorbis, AC3, DTS, ALAC, AMR, FLAC, Monkey’s Audio (APE), RealAudio, SHN, WavPack, MPC/Musepack/Mpeg+, Shorten, Speex, WMA, IT, S3M, MOD (Amiga Module), XM, NSF, SPC (SNES), GYM (Genesis), SID (Commodore 64), Adlib, YM (Atari ST), ADPCM, and CDDA. Container formats: AVI, MPEG, WMV, ASF, FLV, MKV/MKA (Matroska), QuickTime, MP4, M4A, AAC, NUT, Ogg, OGM, RealMedia RAM/RM/RV/RA/RMVB, 3gp, VIVO, PVA, NUV, NSV, NSA, FLI, FLC, DVR-MS and WTV. Then it supports physical digital media like Blu-ray disc, CDs, DVDs and much more.